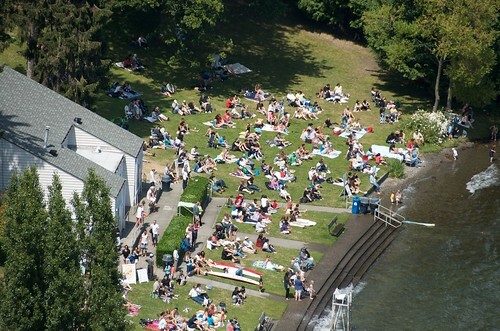 The neighborhood of Madison Park was once the place to catch a ferry across Lake Washington to Kirkland much like residents of Bainbridge Island catch a ferry downtown today. And Madison Street is still the only street that connects Lake Washington to Elliott Bay. Madison Park Beach by thenewamtrak. What was once a cable car connecting these two bodies of water is now a bus, though it doesn’t go straight up Madison. Instead it makes a beeline through our neighborhood, providing our residents with a shuttle to Madison Beach, or what some affectionately refer to as the Capitol Hill Riviera. This is the 11. While you can take the 8 to get to Madison Valley, this is the only way to get to the beach. With highs near the 80s this week, this might be your bus of choice. Because summer! In planning possible cuts in Metro service, the 11 is barely affected. Still service could end earlier in the evening starting next spring if the ballot measure being tossed to the voters is not approved in the fall. This entry was posted in News, etc. and tagged bus stop by Ryan Packer. Bookmark the permalink. Usually air conditioned in the summer….